Nope, this kind of Torque – an excellent Android app that interfaces with the OBD II port in your car. I’d bought an inexpensive “LM327” bluetooth adapter for my car months ago, but never got it running with my laptop. The Android solution worked trivially, and the application works well. If you want to play with datalogging with Torque and you’re using the free version, you must explicitly select each sensor every time you use the application. Tedious, but free. I finally went on a real drive with the car (~10-15 mi) and got logging working. There are many sensors to log, but most of them don’t betray fundamental properties of the car quite like these two do. Lines are not fit. 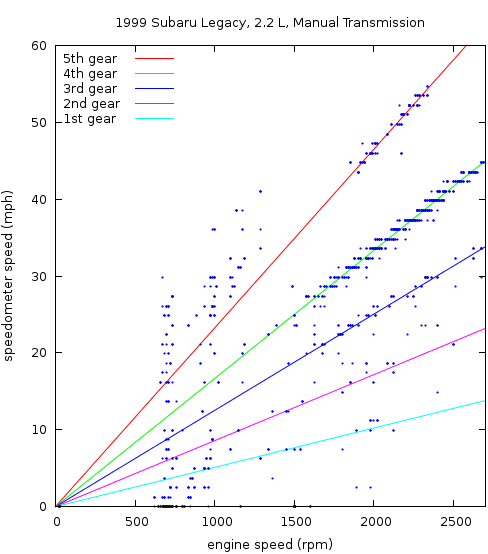 I tweaked the 5th gear line to match the 5th gear data, then used the gear ratios from here to predict the lower four lines. The ratios used were 3.545/2.111/1.448/1.088/0.780. Wikipedia has two values for the 5MT. 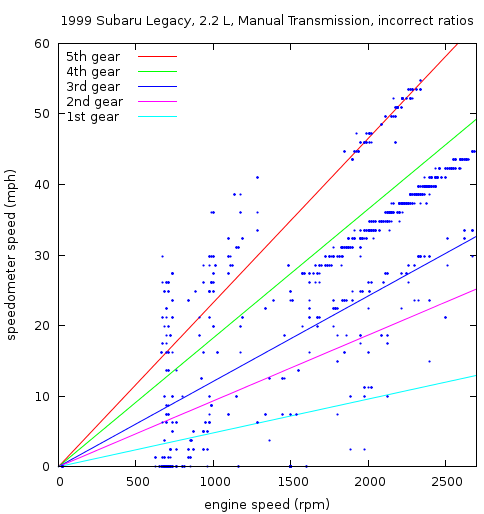 The other ratio stated for “All 1990-2003 with EJ engine” of 3.785/1.945/1.500/0.994/0.780 is in obvious error when plotted with the same procedure. I submitted an edit to this effect; time will tell if it sticks. Same plot, with incorrect ratios. 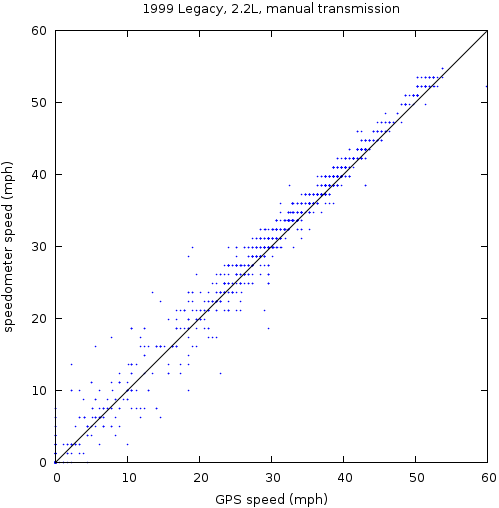 The GPS and my engine computer’s speedometer are neatly locked, but there’s about a 1 mph constant offset between them (easier to see in the residuals). Neat.